The unique tree fern Dicksonia x lathamii which is the only plant of its kind in the world. It was raised by our then curator, William Latham in 1873. Described in the Gardeners’ Chronicle of 1885 as “this very noble fern which appears to be of hybrid origin, was raised by Mr W. B. Latham, Curator at Birmingham, after whom we have named it”. 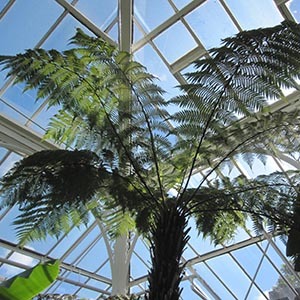 It is a hybrid between the familiar Dicksonia antarctica found in many gardens and the rare and difficult to cultivate Dicksonia arborescens from the Island of St. Helena. The original plant is unique as far as we know and still grows in our sub-tropical house more than 100 years after the chance hybrid occurred.